A friend of mine was trying to make a Leaning Tower of Pisa cake for her sons birthday and while we were chatting about how to frost the cake I remembered how much I love to use Marshmallow fondant. It's the most awesome thing! It's easy to make, it taste way better than regular fondant, and you can use it, in some ways, like you'd use play dough. Get your kids involved - they'll LOVE IT!!! Last year my church was having a fund raiser for the girls to earn money for girls camp. They decided to have a silent auction of baked goods at a church dinner. It was awesome. They encouraged the girls to do the baking but anybody could bring in items. So my daughter and I whipped up some cakes and lots of Marshmallow Fondant and we had a great time decorating. 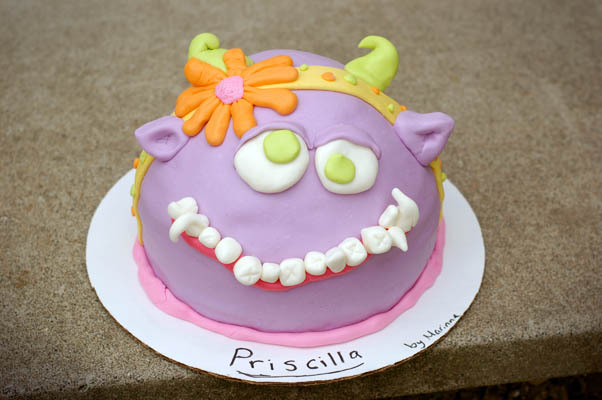 This is Priscilla. She was made by my daughter - isn't she awesome? Priscilla took home the highest bid of the night. My daughter was thrilled and it was great that all the money went towards a good cause. 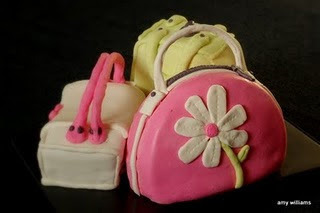 So, my point..... have you ever made, and played, with Marshmallow Fondant? No?! Then you should. It takes only three main ingredients. I don't have pictures of the actual steps but there are two really great tutorials already waiting for you, check out the Cake Journal or Cake Central for some awesome step-by-step instructions. Oh wow I love the idea of Marshmallow Fondant I dont like the taste of regular fondant so this sounds like the perfect solution oh and those "bags" are adorable!! !